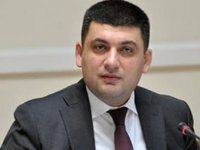 Prime Minister of Ukraine Volodymyr Groysman has stated that the minimum wage will grow to UAH 4,170 from January 1, 2019. "Next year the minimum wage will grow from UAH 3,723 to UAH 4,170," Groysman told reporters during a working visit to Vinnytsia region. The prime minister noted that these changes will be reflected in the draft national budget for 2019, which the government intends to introduce in accordance with the law before September 15. As reported, the Federation of Trade Unions of Ukraine believes that the minimum wage in Ukraine from January 1, 2019 should not be less than UAH 7,700.